Replacing a full row of teeth is a complex process no matter what treatment plan you choose, but when you work with the knowledgeable DD Family Dentistry team, we partner with you to provide a detailed treatment plan to simplify the process. Our Carrollton dentist provides a variety of tooth replacement options, but in many cases, we recommend implant supported dentures because they offer the optimal level of stability and longevity. If you’ve lost one or more teeth, call to schedule a tooth replacement consultation in our Carrollton dental office to determine what tooth replacement option is right for your unique situation. Traditional dentures are removable prosthetics crafted using a gum-colored base material to support a full row of replacement teeth. The denture base is molded to fit against the gum line, creating natural suction that holds the prosthetic in place. When properly fitted, these removable dentures allow patients to regain about 20% of their natural chewing ability. While better than remaining fully edentulous, traditional dentures still significantly limit the diet and are not always an ideal treatment option. 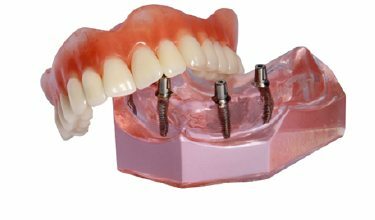 To improve the stability and longevity of your denture, we can anchor the prosthetic to between four and six strategically positioned dental implant posts. Once in place, these implants fuse with the supportive bone and gum tissues, recreating the natural structure of tooth roots. When the denture is affixed to these implants, it looks, feels, and functions almost exactly like your natural smile. Patients typically regain 70% or more their chewing ability, meaning they can consume a nutritious, varied diet. In addition to the increased stability, an implant denture will last for two decades or longer. This is compared to traditional dentures that need to be replaced every five to ten years. If you decide that implant supported dentures are the right treatment option to repair your smile, we’ll complete the process over several phases. First, we need to prepare your smile by removing damaged teeth and applying bone or gum tissue grafts. Then, we can place the dental implant posts. Once the implants are in position, you’ll need to wait three to six months before we can permanently affix your denture. During this time, the implants will fuse with the bone and soft tissue. Once the implants are fully fused with the supportive structures, you’ll return to our office, so we can affix your denture to the implant posts. Once your implant denture is in place, you can brush your teeth as usual. Even though your denture won’t be at risk for decay, you still need to prevent foods and plaque from remaining on your denture and gums to avoid periimplantitis, a form of gum disease that impacts patients with dental implants. In addition to brushing at least two times each day, you should also use a water flosser and/or antimicrobial mouth rinse to limit plaque buildup between your denture and the gum line. During six month dental exams, we can provide guidance to help you improve the at-home hygiene process and keep your implant denture flawlessly functioning for years to come.